Our mission is to take care of a higher quality of real estate brokerage services with committed, dedicated experts with long-standing practice in a socially responsible way. We work for and with people and their vital decisions, such as buying or selling their home. Thus, we strive for the highest quality of services, as we are confident that in this way we can enable our clients to make a decision according to their beliefs, expectations and ideals, thereby contributing to the common goal - the satisfaction and security of our customers. The vision of Roni Real Estate is to become the first choice in selling or buying property on the Slovenian market, for which we will strive for with high-quality services and employee excellence. Integrity is a personal commitment. Sincerity, complete reliability, transparency of all transactions and fairness must be the characteristics of each member of the Roni Agency team. The company values honesty and reality over all others in all their interactions. 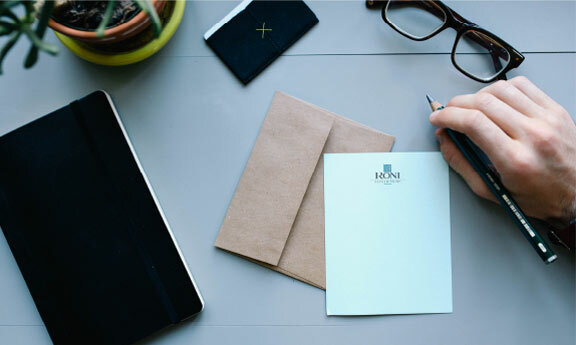 At Roni, we must strive for the uncompromising quality and excellence of our services, activities and business practices. We have set up demanding and specific goals and are committed to meeting our commitments. This is a continuous process. We focus on the end-users of our services. We are aware that real estate brokering is not only a one-off interaction with Roni's customers but a steady and continuous relationship. We believe that our success depends on gaining respect and trust of our customers. Financial strength is the foundation of everything we do. We are committed to maintaining financial success for the benefit of our customers and employees. We are aware that only with financial strength and stability will we develop an excellent offer and provide the best services. We are aware that planning does not plan for failure. Thoughtful and careful planning in everything we do is essential to the success of the company. Striving for victory, being the best and successful team leadership are the qualities of our team. With a winning spirit, professionalism, energy and enthusiasm, we will never suffice with indifference and always believe in success. We believe that flexibility is an essential feature of survival and performance in a dynamic world. While we are faithful to our basic beliefs and values, we will constantly analyse and re-evaluate the need to change the way we operate. We are flexible and resistant and we accept changes as an essential element of our success. At RONI we work together to achieve common goals and promote a spirit of reliability and responsibility throughout the company. We are focused on finding solutions rather than on searching for mistakes. We support cooperation that promotes innovation and creativity. We believe in an open and constructive communication of ideas, observations and concerns. The organization's organizational boundaries must never hinder progress. We are aware that the pursuit of innovation and the development of applied science in our business is a key sign of distinguishing good from average and bad real estate agents and agencies. We use our abilities to find and use new technologies, approaches and solutions that will contribute to the development of the original and improved services in real estate trading. The classic methods of selling real estate are no longer sufficient, due to lack of time and qualified personnel for the high-quality presentation of very complex data (technical, location and content) of today's demands and behaviour of the buyer are no longer answered. Thus, we want to improve the methods of selling and marketing real estate and set new standards. Because we believe that everyone is the best in their field of knowledge, our company with highly professional associates and external business partners and companies offers comprehensive solutions for presentations, promotion or sale of real estate and investment in real estate. Knowing the situation on the real estate market, we have prepared the most appropriate set of services that can help natural or legal persons, agencies, investors and other subscribers to do everything necessary for the successful sale, rent, purchase or investment of their property. Our range of services is defined by a favourable price policy, a professional personalized approach, covering different real estate segments and the possibility of collecting all additional services (from appraisal, expert report, various architectural designs, video and audio recordings, notarial services, asset management services, etc .. .). We present to the natural persons an offer so that they can independently decide on a set of services in the context of the sale or rent of each type of real estate. It is important for natural persons to make their property represented with quality. In the case of exclusive sales, they are personally advised and directed. Furthermore, if necessary, we produce a catalogue containing all the necessary information. Such a catalogue can be printed or sent to potential customers in electronic form. For the content of the material, we help the client obtain the missing legal documents, we take photos of the property if necessary, and create technical descriptions, floor plans and the rest. In the case of the sale of plots, we will devote to the correct presentation of all necessary documents and displays of geodetic data. Our company does not act as a classical real estate agency, as it advises natural persons individually and prepares personalized materials for easier promotion or sale of real estate. By choosing our services we establish a bridge of confidentiality between sellers and buyers, and we arrange a secure purchase and sale of real estate. In the case of major real estate projects and exclusive representation in the sale of real estate, we have prepared special promotional offers for our customers that include the production of a design catalogue and video with pre-delivered content by the client. For all orders, we propose additional services and content, if we believe that they can contribute to a more successful realization of the business. Many real estate agents are not qualified to prepare their own technical and marketing documentation themselves, load it on the Internet or produce a printed brochure for it. Leave a presentation of your investment to professionals and convince the client to allocate a certain portion of the total investment for this real estate. Roni Agency offers marketing services for the real estate area, which it knows well and constantly develops new approaches, tools and educates colleagues to achieve the best possible results. 1. Personalization of the story is the most important factor in the entire process of making all the marketing material. All services are adapted to process individual projects in a personalized, invidious manner so that there is no similarity on the market. The client's financial contribution will reflect the quality of the final product of the sales and presentation material. 2. Photography is the most popular and expanded medium for presenting all the properties of real estate, therefore we pay attention to this medium the most attention. In our set of services, there is also obligatory photography at no extra cost. For all major and special projects, we ask professional photographers according to the type of photography and characteristics of the property. 4. The most prudent and effective promotional tool is video. Uploaded to video portals, customers can easily link it to websites. We use the video for promotion to present real stories for sales or advertising purposes. We can introduce sounds, speech, and music into the video, direct the flow of images, texts, emphasize details and insert different characters (location, technical, etc. ), which further stimulates the interest of the viewer. 5. In order to better present the location of the property and its placement in space, we use aerial photography and recording. Recording and imaging are a very effective medium for presenting the location and the entire neighbourhood. The service is provided by remote-controlled helicopters in a very fast time, which provides lower prices than if they were shooting with classical planes and helicopters. 6. We also make everything the customer needs for a web presentation. From a simple website to an advanced online presence that can include blogs, galleries, forums, animations, banners, ... We can optimize websites to achieve the best positions in web browsers. We can regulate the presence on social networks, we use them optimally to reach a wide range of customers, thereby increasing the possibility of selling and awareness of our and our customer's brand. In advanced marketing campaigns, we perform effective online campaigns. For customers, who want to stay in touch with modern trends on the Internet, we customize the design and content of the website for effective display on mobile phones and tablets, as it is necessary to cover a wide range of electronic devices for every effective online presence. 7. In order to provide a wider service quality and to ensure the fast use of tools and promotional materials, we have developed a system of signs and icons. Characters symbolize installation, location, user meaning, for which such approaches are proven in practice for very effective. With minor changes, the system of characters can be personalized, which gives the client and his real estate additional visibility. 8. Additional services are services that the customer can choose from the set of services from our offer. They are performed according to an individual agreement between the contracting authority and the contractor and represent an additional cost for the subscriber. Most of them represent more demanding marketing tools or add-ons in projects for the further project, promotional and other purposes. Other by arrangement and personalization of the service (representation in auctions, lists of empty real estate, the redemption of real estate of banks, etc.). 9. In order to facilitate the promotion of real estate we also organize events such as exhibitions, charity auctions, concerts and other events. The use of art in industries has been accepted as a positive act by the public. With the correct approach, the events reflect a large number of visitors, which is also a material for broad media reporting. This kind of approach can be the cheapest advertisement for long-term goals.